The Beauty of Aluminum Pallets is more than skin deep! 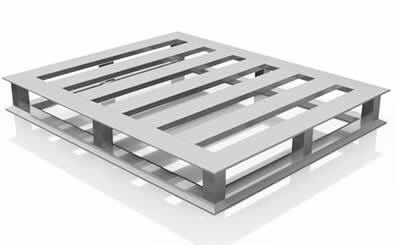 Our aluminum pallets are the perfect solution for your shipping, storage, and warehouse needs. 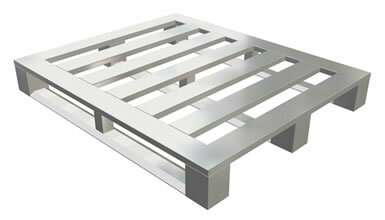 Aluminum pallets will not rust, rot, warp, or burn, therefore giving you a better return on your investment. Also, because of the fireproof quality of our aluminum pallets, they may help lower your insurance rates. Aluminum pallets are stronger than other materials now being used such as wood or plastic. Our Aluminum pallets will reduce your product damage and they are lighter than some wood or other metal pallets therefore reducing shipping cost. Aluminum is truly the new shade of Green! Many aluminum pallets are stackable for space-saving efficiency. Aluminum requires virtually no maintenance, lasts for years and can withstand extremes in temperatures. That makes aluminum pallets ideally suited for closed-loop and automated retrieval systems. Our aluminum pallets are lightweight, durable, repairable, and they are 100% recyclable. Long life and low maintenance costs make Apluspallets the lowest price option. Apluspallets can customize your aluminum pallet to meet specific material handling needs and exact specifications. No custom-mold costs. Custom pallets without the high cost that others charge. We also offer a variety of services including leasing programs. Contact us today for more information. Aluminum - the lightweight shipping and storage solution - lasts for decades, making them a better return on investment than any other material in the industry. Agricultural Industries and Chemical Industries. Factory sales ! Dealers / Distributors always welcome ! If you can imagine it we can build it!